The Fred Hall Boat Show will host the West Coast premier showing of the new Cutwater 30 Sport Top. 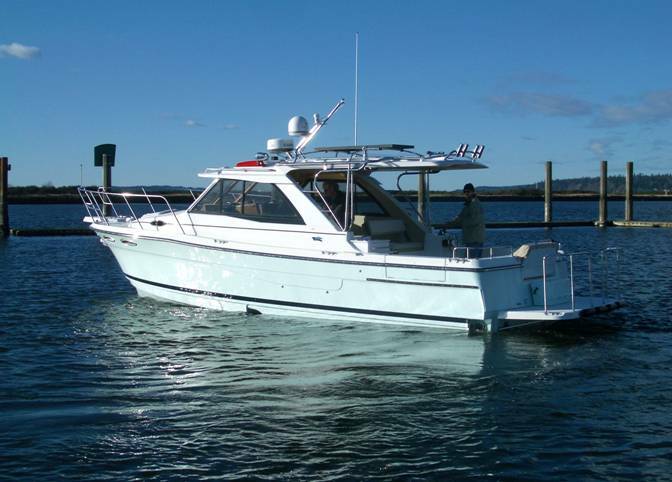 Represented by Long Beach Yacht Sales, the new Cutwater Sport 30 will be shown along with the popular “Boat of the Year” Cutwater 28 as well as the Ranger Tug line, including the Ranger 31 Tug Sedan. Providing an open cockpit freedom in an affordable, quality built “pocket yacht” the new Cutwater 30 Sport Top is a fresh take on the Cutwater Family cruiser featuring a revised cabin top and back deck that invites the outside in. Opening up the expansive cabin to the large back deck allows for more generous entertaining and accessibility underneath the new stainless and fiberglass sport top. New cockpit seating arrangement ( a must see is the innovative “wing” seat design) welcomes up to eight adults without crowding, and the new Euro-style galley is ideal for buffet or refreshment service. The new Cutwater 30 Sport Top accommodates six passengers on three separate berths for exceptional privacy and comfort on extended cruises. On the foredeck, two flush hatches open to reveal cushioned, secure observation seats, along with a central forward lounge that is topped off with its own bow stereo speaker system. Solar Panels act as backup charging for the 12v electrical system allowing more time away from the dock and at anchor. Add to this a long list of other features such as standard bow and stern thrusters, spotlight, windlass and more and the reliable performance of a 370-HP Volvo Diesel inboard for efficient express service to distant waterways, and you have a masterpiece of innovation that ensures unsurpassed enjoyment, year after year. This premier showing will be Wednesday, March 5 at 1 p.m. in the Arena section of the show. Jeff Messmer and Mark Mansfield of Fluid Motion, the manufacturers of both Cutwater Boats and Ranger Tugs will be in attendance during the show. Of course there will be hundreds of boats on display. The Fred Hall Show will also feature: cruisers; high performance boats; tow-boats; deck-boats; pontoon boats; inflatables; aluminum boats, fishing boats kayaks and stand up paddleboards.